Felice Gimondi suffered a crippling time loss early in the race and teammate Gianni Motta was positive for dope, leaving the 1971 Giro rather open. Gösta Pettersson, enjoying terrific form, attacked in the mountains during stage 18. He gained the overall lead, which he increased in the final time trial. Thursday, May 20: Prologue relay, Lecce - Brindisi 6.2 km with 10 legs. Did not count towards GC, only to award first Pink Jersey. Alberto Della Torre and 41 others given same time and place s.t. Motta was declassified a few days later after a dope positive in this stage. I posted results as they were at the time. “The Vikings have landed” trumpeted La Gazzetta dello Sport with the arrival of the Pettersson brothers. As the Swedish national team, Gösta, Sture, Erik and Thomas had dominated the now-discontinued 100-kilometer Team Time Trial World Championship. In 1964 (with Sven Hamrin instead of Thomas) they took a bronze at the Tokyo Olympics. In 1967, ’68 and ’69 they won gold medals at the World Championships as well as silver at the 1968 Mexico City Olympics. Gösta turned in a masterful performance in the 1968 Tour of Britain (then called the Milk Race), taking the lead in the first stage and holding it to the end. Offers to turn pro were plentiful, but the Petterssons turned them all down until 1970. Gösta wanted to avoid the wild-west doping that prevailed among the pros (he also hated racing against the Iron Curtain teams, some of which had very advanced government-financed drug programs) and refused to even consider competing with the professionals until he felt competent drug testing had been implemented. Ferretti team manager Alfredo Martini finally prevailed and signed the four Swedes. Coincidentally the Ferretti kitchen equipment sponsor was owned by four brothers. In his first year as a pro at the ripe old age of 29, Gösta won the Tour of Romandie and the Coppa Sabatini, came in sixth in the Giro and third in the Tour. It was a splendid way to begin a professional career. For the 1971 Giro, Martini put three of the Petterssons in his lineup, Gösta, Erik and Sture. Gösta had shown good early-season form when he came in second to Merckx in Paris–Nice. Spaniard José-Manuel Fuente turned pro in 1969 and made his Grand Tour debut in the 1970 Vuelta. His sixteenth place, 5 minutes 23 seconds behind winner Luis Ocaña, was considered a revelation. The talented climber signed to ride the 1971 season for KAS, one of Spain’s greatest-ever teams. KAS brought their prodigy to the Giro along with Spanish hardmen Vicente López-Carril, Andrés Gandarias, Francisco Gabica and Domingo Perurena. Eddy Merckx decided not to contest the Giro in 1971, choosing instead to ride the Dauphiné Libéré, which he won along with 54 other races that year, including the Tour and the World Championship. Merckx had moved to Molteni where he wore the iconic brown and black jersey of the Italian sausage company from 1971 through 1976. Molteni’s 1971 Giro team was anchored by Herman van Springel, who’d missed winning the Tour in 1968 by only 38 seconds. SCIC (another kitchen equipment maker, as was Salvarani) assembled a first-rate squad with Franco Balmamion, Davide Boifava, Michele Dancelli, Giancarlo Polidori and Claudio Michelotto. Italian observers thought (hoped?) Salvarani’s Felice Gimondi and Gianni Motta would be the men to beat. Yes, these two ferocious opponents were on the same team, some said in order to find a way to beat Merckx. In fact, Gimondi was distressed when he learned that the Salvarani brothers had signed Motta in response to Gimondi’s poor 1969 season. Gimondi felt Motta’s abilities and psychology made them natural competitors, not collaborators, and they had no business being on the same team. Motta initially turned out to be a poor bet, needing surgery in the spring of 1970 to correct an old problem from a crash in the 1965 Tour of Switzerland, making him unable to ride the Giro that year. But in 1971 he came back, winning the Tour of Romandie—the Swiss stage race that comes just before the Giro, often used by Giro contenders to put a fine edge on their form. Gimondi had no significant victories in the spring of 1971, his best result being a second place to Merckx in Milan–San Remo with Gösta Pettersson third. The Salvaranis replaced team boss Luciano Pezzi with recently retired Vittorio Adorni. Adorni announced that for the Giro, Salvarani would have co-captains—Gimondi and Motta. That rarely works. The Giro started off with a relay prologue at Lecce in Italy’s boot-heel which, although Salvarani won it by three seconds over Molteni, did not count towards the General Classification. 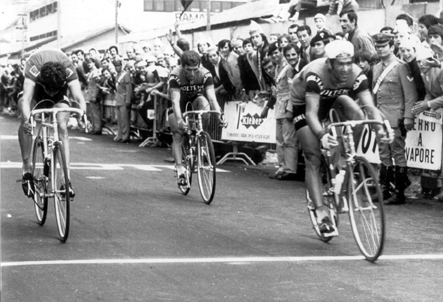 The first stage, won in Bari by Molteni’s speedster Marino Basso, did count, making Basso the leader. The next stage went through the hills of Puglia and Basilicata and Gimondi didn’t enjoy it one bit. He was having a terrible day, trying to disguise his distress, riding in the middle of the peloton during what he hoped would be an easy, or piano, day. But who attacked? None other than his teammate Motta, in fantastic condition after the Tour of Romandie. Motta’s aggression got everybody’s juices flowing, turning the day’s racing red-hot. Gimondi, suffering his giornata no (a day when a rider has no strength), couldn’t stay with the leaders as they surged ahead. To make things worse, Motta had told Franco Bitossi, Enrico Paolini, Dancelli and Pettersson ahead of time about his planned attack as a way to make sure his off-form teammate was put out the back door. Losing almost nine minutes meant Gimondi’s Giro was over almost before it began. It turned out Salvarani’s Giro was over now as well. After coming in second to Paolini in that second stage, Motta was found to have an errant chemical in his system. The disfavor of the anti-doping control earned him a relegation to last place along with a ten-minute time penalty, enough damage to render him completely out of contention. Motta blamed the doping positive on a cup of herb tea. I would have paid good money to have been at the Salvarani team meeting that evening. Paolini now took the Pink Jersey, which he kept until the stage five hilltop finish at Gran Sasso. Vicente López-Carril, first to reach the top of the Gran Sasso, had suffered catastrophic time losses in the second stage, but sitting high in the standings was the day’s sixth place, Claudio Michelotto, and not far behind were Aldo Moser and Ugo Colombo. Several of the main contenders—Pettersson, Fuente, Gimondi, and Zilioli—finished the stage ten minutes or more behind Lopez-Carril. This was the fruit basket upside-down Giro. Several riders came back from the dead when Gimondi led an elite break of nine riders into the Tuscan coastal town of San Vincenzo. Gaining back more than six minutes were Pettersson, van Springel, Moser and Michelotto. Moser was the new Pink Jersey, with Michelotto a half minute back. Pettersson and van Springel were in the top ten, but more than eight minutes behind Moser. Back into the Apennines. At the end of stage eight, where Moser had to give up the lead to Michelotto, the exhausted riders dribbled into Casciana Terme either alone or in small groups. Stage ten gave the riders three good climbs to chew on, the last being to the top of Sestola Pian del Falco, not far from Abetone. Fuente showed why KAS had hired him when he was first over the Passo Radici before finishing alone, though Lino Farisato was only 3 seconds back. La Gazzetta called the stage win a “revelation”, making it two Grand Tours where Fuente was revealed. I wonder if Merckx was paying attention. The first of two time trials was held at Lake Garda where Pettersson and van Springel turned in excellent rides. Davide Boifava won the 28-kilometer race but Pettersson was fourth at 63 seconds, while van Springel was 13 seconds slower. Michelotto was 25th at nearly three minutes. The standings remained unchanged as the Giro traveled to what was then Yugoslavia before heading into the Austrian Alps for a trip to the Grossglockner. Fuente made another attempt for mountain glory and was first to the top of the second major ascent but it was 1968 Olympic road champion Franco Vianelli who carried the day, climbing alone to the top. 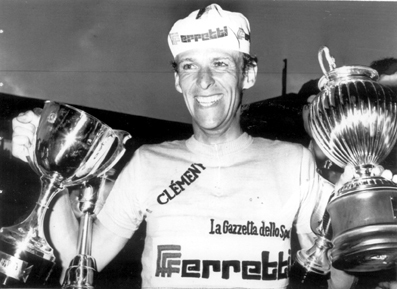 Michelotto had been unable to stay with the main chase group containing Pettersson, van Springel, Gimondi and Colombo. He blew up at the Franz-Josefs Höhe where a friendly car door handle gave the leader an easy lift to within a minute and a half of the Pettersson group. The officials didn’t think that was the way the race should be ridden and penalized him a minute. This was far less than he gained by cheating, and allowed him to stay in pink with Pettersson third at two minutes and van Springel fifth, four minutes behind. Michelotto had expected no punishment for his cheating and expressed astonishment at the one-minute penalty. When Michelotto cracked on the Franz-Josefs, Pettersson and the other strongmen smelled blood. They weren’t happy with his nominal penalty, but the next two days in the Dolomites weren’t going to give the maglia rosa a moment’s rest. Stage eighteen took the riders from Linz in Austria over the Tre Croci, Falzarego, Pordoi and Valles passes. Given that sprinter Marino Basso was the first rider over the Pordoi, one can assume that the pace for the first three ascents wasn’t exactly white hot. But even that pace was too much for the Pink Jersey who must have been exhausted after riding well beyond himself defending the lead for more than a week. Indeed, Michelotto couldn’t stay with the leaders on the Pordoi’s ascent and while descending he flatted, rolled his tire and crashed. With the better riders together on the final climb, Alfredo Martini drove up next to Pettersson in the team car and was distressed to find that his team captain, who didn’t have a particularly aggressive personality, was content to sit in the pack. Martini knew Pettersson was riding into magnificent condition and also knew this was the time to make a move. “Don’t you know how strong you are?” he yelled, and screamed at the Swede to attack. The rest of the riders told Gösta to ignore Martini. At Martini’s furious insistence Pettersson took off with several good riders for company, the move turning into a four-man break of Pettersson, Gimondi, van Springel and Francisco Galdós. Gimondi led them into Falcade ten minutes ahead of Michelotto, who was sporting a bad head wound from his crash. The next stage had three ascents including the Passo Tonale. It didn’t change things much, except that van Springel was able to sneak into Ponte di Legno 19 seconds ahead of Pettersson. With only the 20-kilometer final-stage time trial left to affect the standings, that could be a big deal. The gap between them was now only 102 seconds and both van Springel and Pettersson were good against the clock. Giacinto Santambrogio wins the penultimate stage ahead of Wilmo Francioni. But, there was no way van Springel, as competent as he was, could take the Giro away from Pettersson, one of the world’s best time-trialists. Ole Ritter won the stage while Pettersson was second at 39 seconds. Van Springel gave up 22 seconds to the Swede, but it was a good enough performance to move him past Colombo into second place. Pettersson’s director Alfredo Martini is given a lot of credit for Pettersson’s careful, economical and measured climb to the lead. Pettersson didn’t waste a single watt, winning a difficult Giro à la Balmamion, without winning a single stage. Martini said that if Pettersson had been a more aggressive rider, his talent would have allowed him far more victories during his short professional career. Gimondi returned to good form in time for the World Championships where he and Merckx fought an epic duel. The two were alone together for the last twenty kilometers as the Italian withstood attack after attack from Merckx, with the Belgian prevailing in the final sprint. With each acceleration from Merckx, Gimondi would literally grit his teeth, so much so that during the intense final lap, Gimondi dislocated his jaw. Champions are different from the rest of us. For much of the twentieth century, Italian sport was cycling. The newspapers sold millions upon millions of copies to the sports-mad Italians who gobbled up the news of their heroes. But Italy had changed. Following the end of the Second World War, Italians desperate for work poured into the great manufacturing cities of the north, creating an enormous well of cheap labor that fueled Italy’s post-war economic miracle. But big cities are poor venues for road racing. As a result soccer, a stadium sport better suited to city living, grew in popularity. Adding to bicycle racing’s woes was television, which had gone from a rare luxury to an important part of western life. Televising the moving circus that is a road race is a complex, expensive and technologically demanding enterprise. In addition, no one really knows how long a bicycle race will take, making it a scheduling nightmare. Setting up television cameras in a soccer stadium, on the other hand, is a comparative piece of cake. By the 1970s, professional cycle racing was scrambling to find a way to remain important. To make things worse, over the following decades, the owners of the Giro regularly botched the sale of the Giro’s broadcasting rights, costing it vital spectators when it needed them most. Even the Tour de France had become tawdry with exhausting transfers designed to maximize the number of stage towns paying for the privilege of a Tour visit along with countless awards, each with a sponsor chipping in a few francs.